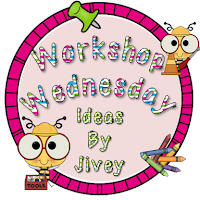 It’s Workshop Wednesday time! So many ideas on Wednesdays-I love it! Notice I’ve made my center groups folder with Post-Its (my fave) so that my groups are flexible-all I have to do is move my post-its (once I get my student list/data there will be names on them). I have 5 center groups-blue, yellow, green, purple, and red. I like to start centers by the second week of school, so they get used to our routine as soon as possible. Because my center groups are heterogeneous, it’s hard for me to memorize which student is in which group, so I made this chart for ME and I keep it at my guided reading table so I can keep track of my students. At a quick glance I can check to make sure my students are at the correct center group. I also like to meet with each student individually the first week of school before I start guided reading groups to complete this Reading Interest Inventory I made. This form and conference time gives me so much information about my students! I love this time with each student. In a 5 minute conference I learn so much without any written assessments. How many books do they have at home? This number will give me a lot of background about the family as readers and will allow me the chance to send a “care package” home so they will always have something to read at home. I love hearing their answers to "What makes you a good reader?". Actually, I get more "strategy" answers from my struggling readers, where as my higher readers don't always know what makes them good readers because it's automatic for them. I have them read me a page or passage from the current book they are reading. This gives me a quick check on fluency and comprehension. I also have my students set a reading goal for themselves, some need a little more guidance than others, but it’s important that it’s their goal and not mine. I want them to be motivated to complete this goal and if it’s my goal, I may not get the buy in. For example, I may need to offer guidance or probe if they don’t have any reading goals or make unrealistic goals, like read 200 pages a night. *Goals need to be realistic, measurable, and motivating! If you think this Reading Interest Inventory would be beneficial in your class, you can pick it up at here at my TPT Store for FREE. Just be kind, if you download, please leave feedback. Go check out all the wonderful ideas by Jivey and the other fabulous bloggers that link up! If you haven't received your goodie in your inbox, I need your email please. Don't forget to link up this Saturday! What have you been working on this summer that will motivate your students? Any idea can be used! Let's get motivated together! Thank you for the freebie. I love that you ask how many books are in their home-that is a great idea. What a quick way to learn about the family habits. Thanks so much for linking up such a great, detailed post! :) I love the reading inventory- I do one also, but hasn't thought about the number of books at home. Thank you!! I love your center groups folder! Great idea! I love everything about this post - the reading inventory conference and the post-its! Thank you for sharing! Great post! I LOVE your small group folder! I've been thinking about making a small group binder (I usually just have a tab for small group in my teacher binder). This folder would be great to use! Thanks for the inspiration. Love your survey! Thanks for sharing this awesome idea! Love the post-it note idea, going to incorporate it into my R180 folder. Great post. I love to teach reading and also use the Inventory survey each year. However, I love your care package idea. I never thought to ask about their reading library at home. Good idea! What great ideas! I'm teaching a special class this year, not quite special ed, not quite average, kind of the fall between the cracks kids. I imagine the question about the number of books will be very telling, and I LOVE your idea about a care package! I actually get a little extra money to spend on these kids, to buy them books, but hadn't quite figured out how to use it until reading your post. Now I'm a life-long follower!